Mike Lane was born in 1941 in New Haven, Connecticut. He was commissioned through the Air Force ROTC Program at the University of Notre Dame on February 1, 1964, and went on active duty beginning June 6, 1964. Lt Lane completed Undergraduate Pilot Training and was awarded his pilot wings at Laughlin AFB, Texas, on April 23, 1965, and after completing Survival School at Stead AFB, Nevada, and F-4 Phantom II Combat Crew Training at Davis-Monthan AFB, Arizona, he was then assigned flying F-4C Phantom II fighters with the 91st Tactical Fighter Squadron at RAF Bentwaters, England, from October 1965 to October 1966. He then deployed to Southeast Asia where he flew combat missions with the 559th Tactical Fighter Squadron of the 12th Tactical Fighter Wing at Cam Ranh Bay AB, South Vietnam, until he was forced to eject over North Vietnam and was taken as a Prisoner of War on December 2, 1966. After spending 2,271 days in captivity, Capt Lane was released during Operation Homecoming on February 18, 1973, and then was briefly hospitalized to recover from his injuries. He next completed an Air Force Institute of Technology assignment at Florida Tech University in Orlando, Florida, followed by service as a System Program Management Officer with the Armament Development and Test Center at Eglin AFB, Florida, from August 1975 to June 1978. 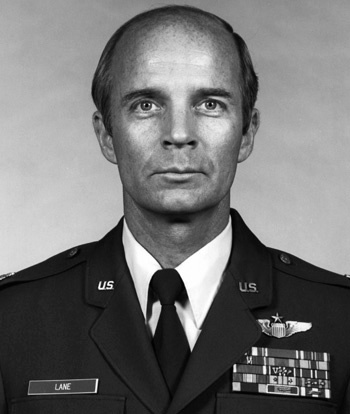 His next assignment was as Chief of the Plans and Integration Division with the Air Force Acquisition Logistics Division at Wright-Patterson AFB, Ohio, from June 1979 to June 1981, and then as Director of the KC-10 Program Control, and Deputy Director of Tanker Systems, with the Aeronautical Systems Division, also at Wright-Patterson AFB, from June 1981 to May 1985. Col Lane served as vice commander of the Air Force Human Resources Laboratory at Brooks AFB, Texas, from May 1985 to May 1986, followed by service as Chief of the Operational Training Division with the Air Force Human Resources Laboratory at Williams AFB, Arizona, from May 1986 until his retirement from the Air Force on October 1, 1988. 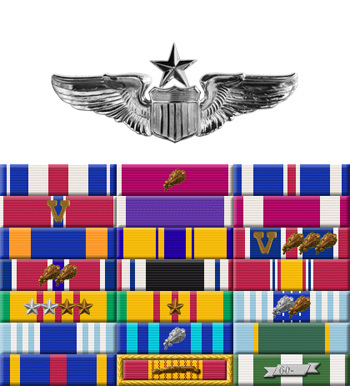 For the Period December 1966: This officer distinguished himself by gallantry and intrepidity in action in connection with military operations against an opposing armed force during the above period while a Prisoner of War in North Vietnam. Ignoring international agreements on treatment of prisoners of war, the enemy resorted to mental and physical cruelties to obtain information, confessions and propaganda materials. This American resisted their demands by calling upon his deepest inner strengths in a manner which reflected his devotion to duty and great credit upon himself and the United States Air Force.